As we all know, whether they are in your life or not, having a dad is a very special thing. They take care of us, look after us, helps us, and generally make sure that we are equipped to get along in this crazy world. (They are of course partners in this endeavor with a significant other but since this IS a Father's Day story we are gonna focus on the men!). And as great as it is to know our dad's, we also get to share our cinematic fathers with people we don't even know. In some cosmic way, we are now related to other moviegoers all because of this paternal person on the big screen that we admire. Now, while we all love seeing a Mrs. Doubtfire-type dad, there's something about seeing a father who isn't afraid to pick up a gun and blow somebody's head off that really grabs us. 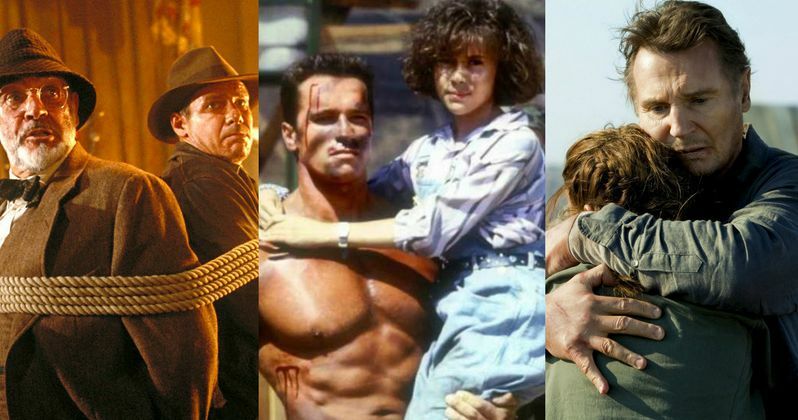 So, in honor of all the father's out there, we chose these "15 Badass Action Movie Dads" to celebrate! Read this story and give your old man (or men!) a hug from your MovieWeb family. In this film, not only does Arnold Schwarzenegger escape an airplane in mid-flight, he essentially kills all the bad guys to save his little girl. It isn't because he's willing to kill or fight anybody who gets in his way. It isn't because he's willing to dangle and drop people off cliffs. It isn't even because John Matrix can use his military skills to figure out the coordinates of his stolen daughter's location. It's because when he makes a promise like, "I'll be back", he keeps it!